The training of future tradespeople in our industry has undergone many changes, yet one aspect is constant. Progression through to being qualified is based on time. There are modules and, in some states, ‘capstone’ assessments (university language for ‘final exam’). However, you don’t gain a licence in our industry without being an apprentice for a set time. Over the years, education bureaucracy geniuses (and a former federal employment minister) have railed at me that our industry must move with the times and not become a dinosaur. We should allow entrants to progress through to the final qualification based on their ability to complete modules only – also known as competency-based progression. Our system is broadly based on the principle that apprenticeship modules be completed in conjunction with on-site experience. This allows apprentices to enhance their knowledge with useful practical experience. Critics outside the industry will cite other trades and professions that don’t tie their training to real-world experience. My response is that there are only three days between a bad haircut and a good one. You could train hairdressers in a classroom only, and not many buildings would burn down if they got something wrong. Other responses could be: do we allow pilots to learn only in a classroom then give them a licence? 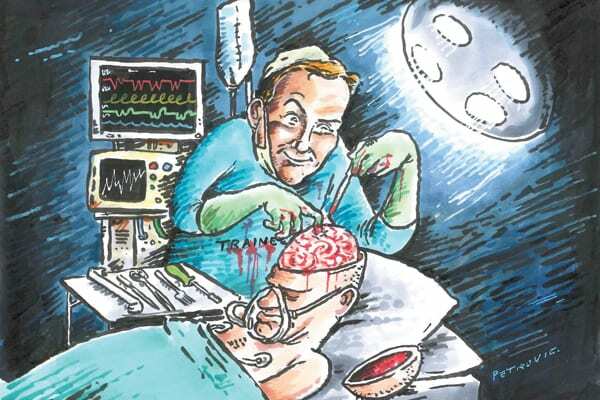 ; do we allow brain surgeons to practise in a classroom then let them loose on patients unassisted? Yet there are many potential changes our industry should be open to, and there have been many reviews into the apprenticeship system. Entry and exit points of the training system. Module suitability for industry needs. Industry surveys on the suitability of apprenticeship. Direct apprenticeships versus group training. It is our industry. We ought to determine how we train and develop people. No one cares more about our industry and its future than we do. Can government and training bureaucrats really know better? However, we must accept that our new tradespeople be familiarised with the new technologies they will face in their early careers. Here is an issue: our licensed people are among the worst for post-apprenticeship training or continuing development. Once we get the licence we generally lean on our training for the rest of our working lives. Can we continue with that mindset? Last month at the Integrate Trade Show in Sydney I was struck by how close our electrical contracting industry is becoming to the audio-visual and automation sectors. We need to understand and embrace these other sectors and the technology. These sectors are no longer on the fringe. There are many specialists, but mainstream electrical contractors need to expand their skills and service offerings. This brings me to my main point: are we mature enough to allow new technologies onto the list of elective modules and into our apprenticeships as options for future tradespeople? This then raises the bigger question, do we ever ‘split’ or create a second licence? Or, as the experts call it, do we create different channels that ultimately restrict licensed tradespeople to what they have chosen in the elective modules through their apprenticeship? This idea has been around for ages, and I have some real problems with it. However, if we don’t provide our future people with options and other directions we may lose the right to control our future. Bureaucrats will push this change, and we won’t be in any position to manage the safety aspects. This is a challenge in other countries, where the electrical contracting industry has stayed in its traditional place and personnel have become a lower class of tradespeople. All they are engaged to do is the front and final connection. The highest-paid tradespeople or technicians are no longer just electricians. They are multi-licensed and trained in all types of low-voltage systems in addition to traditional electrical work. Ignoring this will cause our trade to be diminished, with a lesser role in all buildings. Wi-Fi being run over lighting circuits, lights being controlled by Wi-Fi and using 240V cabling infrastructure to run communications are all examples of newer technology merging with our sector. An apprentice being trained in 2016 needs this kind of background. An open and honest conversation needs to start, again, about training updates and continuing development for our apprentices now and in the future. Wage structures, training costs and access to technology all need to be part of the conversation. A modern, flexible, tested and trusted system needs to be developed from our current base. Contractors, educators, regulators and technology suppliers need to engage in this process to make sure we retain the safety record of the electrical industry. Appropriately trained and tested tradespeople should be installing the new systems in Australia – without splintering into hundreds of minor vendor-trained categories. Our industry must be the installer of choice.